Fold one of the squares in half diagonally to form a triangle. Fold that triangle in half two more times. 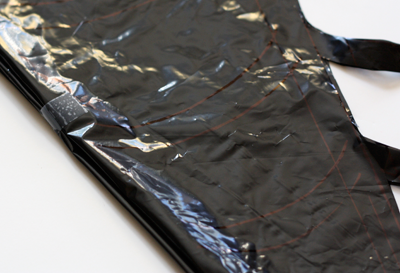 This is slippery stuff, so use a few pieces of tape to fasten the layers together on the loose side. It will help hold the shape together when you're cutting. 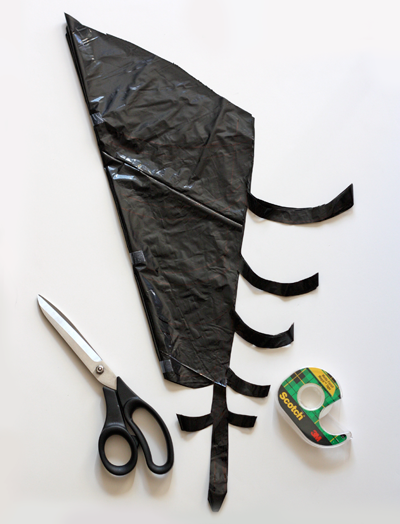 If any of your tape pieces end up on the web itself after you've cut it out, remove them before unfolding. If winging it makes you nervous, use a black Sharpie to sketch some guides on the plastic: draw a "stem" from the folded point out to the end of your triangle. Then sketch some scallops that come off the stem. With a scissors, cut out the negative shapes and unfold your web. Tape several webs together and add extra strips of plastic to connect them if you like. 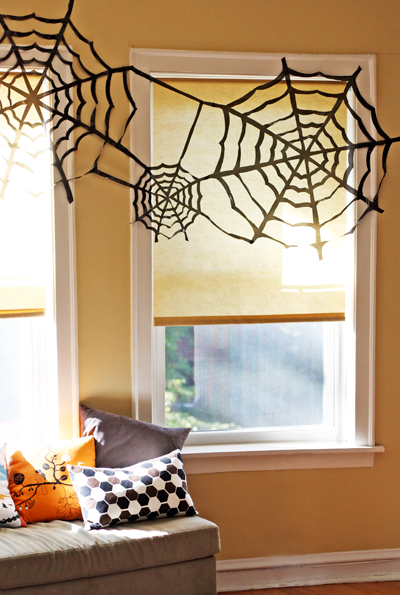 You have read this article decorating / halloween / tutorials with the title Cheap trash bag Halloween decorating. You can bookmark this page URL http://jenkrebs.blogspot.com/2011/10/cheap-trash-bag-halloween-decorating.html. Thanks! No comment for "Cheap trash bag Halloween decorating"